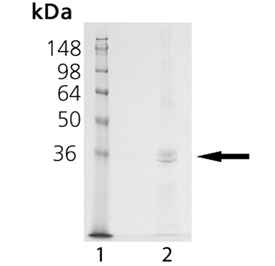 Recombinant glycosylated catalytic domain (aa Pro18-Val477) of ADAM17/TACE (A disintegrin and metalloproteinase 17; Tumor necrosis factor-α-converting enzyme), cloned from human cDNA (NM_003183), secreted as mature, active enzyme from insect cells, and purified using a C-terminal His-tag. Source: Produced in insect cells. Produced in a baculovirus expression system. Formulation: Liquid. In 22.5mM TRIS, pH 7.5, containing 4.5µM ZnCl2, 0.0045% Brij-35 and 10% glycerol. Specific Activity: ≥1800 U/µg enzyme. One unit will hydrolyze one pmole Mca-PLAQAV-Dpa-RSSSR-NH2 substrate (Prod. No. BML-P132) (10µM) per minute at 37°C, in 25mM TRIS, pH 9.0. Application Notes: Useful tool to study enzyme kinetics, cleave target substrates, screen inhibitors. Use/Stability: Salts (sodium chloride, calcium chloride, etc.) in the assay are inhibitory. ADAM17/TACE is stable after 6 freeze-thaws at ~0.4µg/µl; freeze-thaw stability of more dilute preparations has not been tested and could lead to loss of activity. Scientific Background: ADAM17/TACE is a soluble or membrane-bound metalloproteinase primarily responsible for activation of proTNF-α, while also targeting proteins such as fractalkine, amyloid precursor proteins, and CD40. ADAM17/TACE is involved in cancer, vascular disorders, and inflammatory diseases such as rheumatoid arthritis and focal ischemic injury. The catalytic domain of ADAM17/TACE is able to cleave proTNF-α and can be used in inhibitor screening. SDS-PAGE analysis: Lane 1: MW Marker; Lane 2: 1.0 µg of Prod. No. BML-SE268 ADAM17 (catalytic domain) (human), (recombinant) (His-tag).